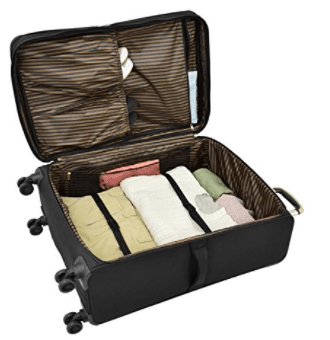 London Fog Langley 1297 is a 29-inch size stylish and modern, high-end spinner suitcase with great quality inner and outer materials and components. It scores 4.8/5 stars out of 7 ratings on Amazon.com by customers that purchased the product, which indicates a decent quality bag that seems to make people happy. Langley is rather lightweight but not as in cheap light because it is quite solid and durable. It is a single 29” bag that measures 12 x 19 x 29 inches and you can purchase it in other sizes of 25 inches, 21 inches, as a 20-inch duffel bag, 8 wheel 15” under the seat bag or as part of a 5-piece set that should work out twenty percent cheaper than purchasing them separately. London Fog Langley is an expandable bag that can be expanded by two more inches so you have more storage. It is made of a special tough ballistic fabric that is contrast striped over hyperlight, dobby weave accent. It has the full London Fog striped polyester lining and includes three zippered storage pockets and interior shoe pockets. Caster wheels are the best and the suitcase moves on any ground very easily and smoothly. 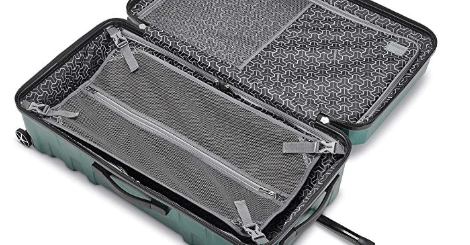 The telescoping locking handle looks a bit different and actually better than other suitcases as it includes the ergonomic comfort grip. You also have the carry handles on the side and the top. 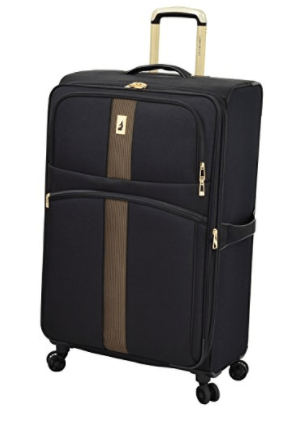 The Langley 29” suitcase is easy to maneuver thanks to the multi-directional 360-degree rotating dual wheels. It comes with corner guards for added protection and the self-repairing nylon zippers appear to be high quality. This great bag not only looks beautiful but has a very solid construction, and has an ergonomic design. For example, the telescoping handle is pulled up instantly with the touch of a button and locks at three points. It is very spacious inside, holds quite a bit and is nice to have different compartments and pockets that make it easy to organize your belongings. The front pockets are large and great for your smaller items like your passport that you’d need to access easily at the airport. The advantage of having a durable soft-sided bag over hardshell bag is you can actually squeeze in more stuff. But it can certainly withstand the rough treatment by the airline staff. Even if you get the black Langley it has a unique design and it will always be easy to find it on a carousel. It really is hard to find any cons, seems to work very very well and we highly recommend it. It is an imported product but is stocked in the US and the shipping will usually be fast via Amazon. It is sold in two colors of black (1297-BLK) or Bordeaux (1297-BOR) with a seven dollar price difference on the day of this product review.